The sound system in a bar, nightclub, or restaurant, even when designed and installed with the best intentions, can still seem to fall short of expectations. Often enough though, it’s just operator error that is at the root of the problem. Once your sound contractor sets up the system and calibrates it for optimum performance, if there is any flexibility present in the system, to allow for staff to adjust EQ and level, then also present, is the possibility of subsequent, improper adjustment of those controls. #1 – Turn it down. At least a little; on occasion this is really all it takes. Too much overall volume level can overload the system. If your system components are equipped with them, watch the meters, if there is too much red, then there’s too much level (somewhere) in the signal chain, causing otherwise avoidable distortion. This can have the effect of making your clients have to talk over the music because that can’t hear each other and that just tires them out and makes them want to leave (this can be a subliminal effect; they can’t put there finger on it but they know they just want to leave), therefore spending less time and money in your establishment. If your system has more than one zone, make sure the level in each one is appropriately set to enhance guest experience, not detract from it. #2 – Adjust the tone controls (bass and treble), or EQ. Perhaps you had a thumpin’ party booked at your establishment the night before and it called for a little more “bass in the place”. All well and good, as long as the system is designed to handle such but if the EQ is not returned to its normal settings, the additional bass may be too aggressive for the day to day mood you set for your clients, especially if it’s a restaurant. On the other hand, if the system is not designed for such, you may be overloading it with low frequency and at best the system will sound bad and at worst you’ll be courting damage to your speakers and inadvertently driving away customers. #3 – Observe proper gain structure. With more complex systems there may be several points at which level can be adjusted. There’s the output level of your external device (if it is not a fixed output level), the input gain level (going into your mixer), channel, or mix level (internal level set against other sources; for example: the singer’s microphone level as it compares to music they are singing to) and then output level (the level of combined elements being sent to amplifiers and speakers). This is most likely the scenario when using a DJ mixer, or multi channel mixing board as your main level controller. This is another instance where observing the meters can be of great assistance in determining proper levels. LED meters usually operate with the three color code used with traffic lights: green, yellow (sometimes orange) and red. Green indicates the presence of signal and nominal (optimum) signal level, while yellow indicates an approach to possible excess, as in traffic, it is a warning to proceed with caution, red in turn, indicates the reaching of that excessive and possibly dangerous, level. A general rule of thumb is to strive for adjustment of all levels to be at their nominal range (anywhere from 11 to 1 o’clock on knob type controls and just below 0db of fader level controls (around 6 to 8 of rotary controls, marked 1 – 10). Your system employs either separate amplifiers, or powered speakers; don’t overlook checking the input levels on those as well. Too often I see amplifiers and powered speakers with their input levels at maximum because they are erroneously perceived to be power/wattage, controls, rather than the amplifier input sensitivity controls they really are. If your volume level is set low but the sound is loud, then the amplifier input is too high. Conversely, if your amplifier is all the way up and you can’t seem to get enough level, then something in the chain is set far too low and you are probably amplifying a fair amount of system noise. Turn the amplifier input controls all the way down and turn off the amplifier. Make sure all EQ settings are flat. Set the main output level on the mixer, to just below the 0db mark and do the same with the channel fader, or knob. If the levels are not marked as such, just ballpark it and set them to their midway point. Go to the beginning of your signal chain. For this example, let’s use an audio source device with a variable output (volume control), like an mp3 player, iPod, iPad, laptop, etc. Rather than automatically adjusting its output to maximum, try first, to make it 75% of its maximum output. Then carefully adjust the input on the mixer until you see red on the input LED and then lower the level until it is no longer overloading (mostly green with some yellow). 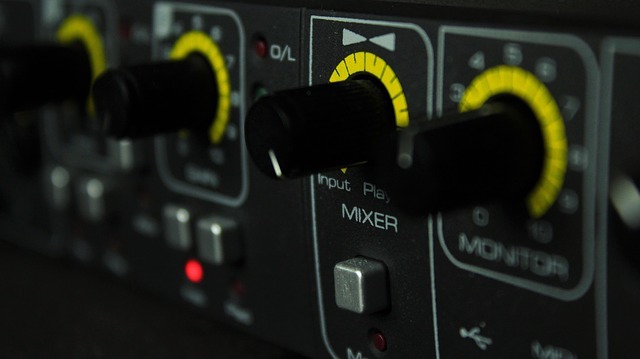 If you find that you need to turn up that first input level, to more than 80% of its limit; then you’ll need to go back and increase the output level of the source device and have that input level on the mixer, ideally, be no more that half way to its max. Now observe the output meters; are they in the red, if so back off on the channel level control until you are no longer in overload, while leaving the master output level just below 0db, or at its halfway point, if it is a rotary control. Once this is done, turn on the amplifier and slowly turn up the input level until you have sufficient volume for your immediate needs. This will provide low noise/high headroom signal level. At this point you can start adjusting tone controls/EQ settings to balance the low/mid/high frequencies of the music to suit the environment. Results may vary from system to system and from one situation verses another, even with the same system, depending on how loud your source is and how loud you need the system to be, at that moment. With a little care and patience you’ll find the level settings that allow your system to perform its best in any given situation.